My Akita mix is rather polarizing. Strangers often stop me on the street and ask if he is an Akita. Either they hate him immediately and tell me off for walking him in a neighborhood or they gush and tell me how beautiful he is. Even after I explain he is a mix no one ever changes their tune, he's wonderful, or they hate him. Do Akitas specifically and Nihon Ken in general, always get such extreme reactions, or is it just the people in my area? Dog parks: "How did you get a fox?!" "Is that a dog?" "She's so wolfy!" combined with a lot of attention lol. Streets/Walks: Usually comments of "Aww she's so cute/dainty!" and little kids will always want to pet her. Ren's not all that comfortable with strangers, much less hyper kids. So that doesn't always go that well, but if they're polite and actually listen then I'll hold Ren while they can gently pet her neck. People are curious about her, and it usually results in me trying to get them how to say 'shikoku' correctly... not 'shikuukuu'. And then I give up. That, and emphasizing it's not a shiba mix. I sense a little hesitation once in a while, especially after comments such as "she looks like a coyote"... but overall it's been ok. Mostly just generous compliments. There's no real baggage with the shikoku breed, though, so I don't expect any negative attitudes going her way. Mostly just lots of questions and "awwwwe she's like a long legged fox!". Once in a while I feel obligated to tell people she's talky when she plays. Some people aren't used to that and it freaks them out. I've seen people with stigma against American Akitas, but not so much the Japanese Akita. Weird! I try not to let children pet Tin just because he is so large and tends to excite easily (we're working on that) but if they insist and seem ok around big dogs I let them ruffle him up a bit. Tin loves kids. For me the kids have never really been the problem it's the parents. I'm praying the Akita doesn't go the way of the pit bull. I'm hoping seeing Tin on a regular basis might change their minds about the purebreeds. With my 3 it's usually the following from kids; "That one looks like a fox! That one looks like a wolf...no, it looks like a coyote!". *Shrug* I usually cross the street when people are incoming because 3 dogs on leash is enough to make anyone wary and I don't usually abide by making sure my dogs are on a strict "heel" so they can enjoy the sights and sounds of the outside. Them: "Are they Shibu Emus?" Me: "Shiba Inu? Well, that one is. These two are cousins of a Shiba." Them: "Oh, well they're beautiful!" Them: "Oh they're beautiful, what are they?" Me: "Thank you. These are Japanese hunting dogs/huskies." Them: "Well they're just beautiful." Them: "Oh, what are they called?" Me: "Shikoku. Like the Japanese island of Shikoku? Me: "Just do a google search for 'Japanese husky'"
People try to pet TK without asking ALL the time. I have to constantly be on guard because he WILL bite them. - "what breed is that?" People tend to not stop me about the Kishu as much. I think they assume they are mixed breeds because they aren't as obviously refined as the Shikoku. We get Akita and Shiba Inu for both breeds, too. I get a mix result for Ty (kai ken). Although, I love it when people are very determined and say that he 'is a mix'. Even after going through the spiel of Japanese etc. and then my favorite - "Is that a Hyena!?" "He isn't? He sure looks like one" "Oh, well that's cool"
Although, I do get the occasional "He is GORGEOUS"
I even have a neighbor who will stare at him (and my shiba) when they are on the balcony, because she cannot get over who amazing they look. Yea, she's creepy. Yeah I've used the term 'Japanese wolf dog' more than once. When I respond with 'shikoku' that usually gets a 'huh?! What's that?'. 'A bigger breed than a Shiba but smaller than an Akita' just seems kind of clumsy. Everyone thinks he is an awesome looking dog though. I've only been asked if he was a coyote once. We have an ID card for Rollo for when we travel but the vet tech put on the card that he was a Shiba inu. We actually argued with her and had her do a google search for her to actually believe that a shikoku is an actual breed! Always get the comment " your huskies are so beautiful"
to which I think it's not worth it to correct and just kindly reply..."Thank you!" Kouda (Shiba) gets called a fox and husky all the time. Followed up with "how big will she get?" - always female, lol. 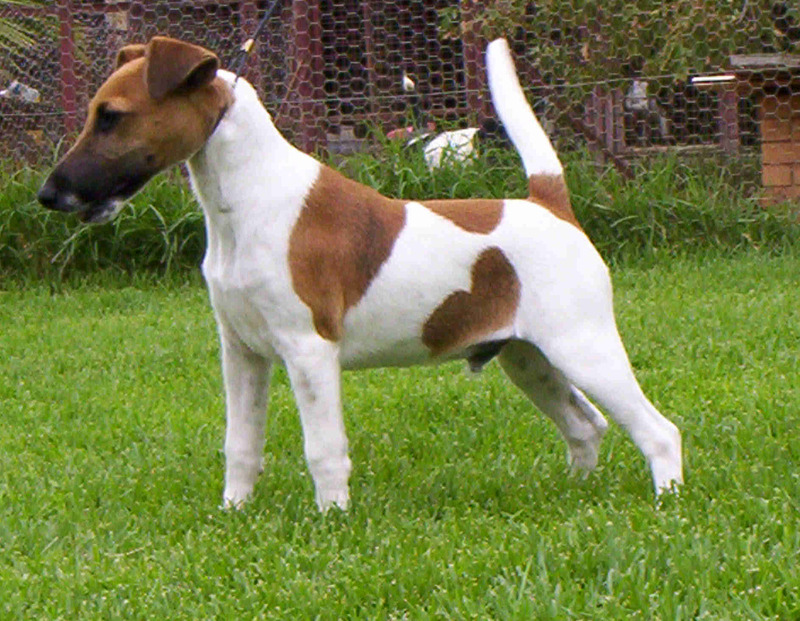 Fox Terrier?? That's not even close! With, Kuma and Kiyomi on leash most people tend to steer clear. I think Kiyomi looks a bit intimidating to most folks. I personally dislike including "wolfdog" or "husky" in my breed explanations because I don't think they are accurate to the temperament of the Shikoku I have met. They act more like a terrier and a herding dog love baby, to me, so I usually just tell people the breed name if they seem genuinely interested or say "Japanese boar-hunting dog", lol. I don't even say "boar" because I appear to lose all credibility when i do and conversation stops. Nobody believes these little dogs hunt boar (they only seem able to envision catch dogs), so I say "one of the hunting spitz-types" or "Japanese hunting dog." THEN we get down to "looks like a fox" or "pretty sure that's a coy dog." but only if it's Juno. Matsu is easily accepted as a "dog" and most people ID him as a young akita or akita mix. Nobody ever says he looks like a fox or a coyote. I never used to add "boar" in there, @wrylybrindle, but I remember when I was talking to Jessica about the Shikoku - when I went to meet her dogs - was when I started including the "boar" part. She brought up some points that made sense to me: when you say hunting dogs, people think retrievers and spaniels. When you tell them what they hunt, it paints a much different picture of the dogs because they ARE so small. me: It's a Japanese hunting dog, related to the Akita. If I feel that the person make get dollars signs in their eyes, I just go straight to saying she's a Japanese hunting dog or miniature AKita, and often they just assume she's a pretty mutt. It's just easier for the asker if I reply with 'Japanese Wolfdog' and like I say, they can research it closer if they want to because it's a hell of a lot easier for english speakers to remember than the alternatives. Haha. Though if they tarry a while, I'll go in to the proper breed name and expound on their histories a bit. It's just a mouthful to go in to if you do it for every person! These are hilarious. Our shiba always gets confused and interested comments because I guess Black and Tan shibas are not as well recognized in our area. Happily, mika loves kids and attention from them, so she's happy to oblige as the smallest of our dogs when kids want to pet her. My moms red stocky shiba definitely gets the "You have a pet fox?!" reaction a lot. But the best was when we had our rhodesian ridgeback out at the dog beach and a guy remarked to his lady friend, "that's one of those lion killing dogs, the Ethiopian Pinback." If one more person asks me if Nyx is a "shibu" and/or repeats "shikoku" as "shikoko," I'm going to swat them on the nose. Is this wrong? Are we bad ambassadors of the breed/NKs? It drives me up the wall. The worst is when people whisper "shibu" in passing and don't give me a chance to correct their egregious mistake. People always ask if she's a fox, wolf, or coyote. I've learned the word for "wolf" in Spanish because of her. The most common assumption is that she's a husky mix and although we don't get it nearly as much as when she was a puppy, basenji was commonly thrown in there. Also,most folks assume she is going to be super friendly, maybe because she's got such a cute face, but she mostly ignores them. Some people are pretty relentless with trying to get her attention so we have to body block and run away. Nero has been called the typical 'wolf' 'fox' 'shiba' etc. I just tell people he is a cat. Most people I meet think Kiyoshi (Shikoku) is a coyote, german shepherd, akita, wolf, shiba inu, or husky mix. Everyone thinks he's gorgeous except a lot of people get scared when he looks them directly in the eyes and stares....lol But I like when there's people that want to know about the breed and will keep asking me questions and try to figure them out. Say they want to do research them/google it. The biggest problem is that most people can't spell Shikoku, let alone pronounce it, so I made business cards for Kiyoshi with his breed info and fb page link on it :) They're adorable hahaha. That way there's no excuse to NOT remember how to spell SHIKOKU and they can take it home and look it up :) Maybe even decide to get one someday, who knows! I usually just say "Japanese hunting dog" and more often than not that's all they care to know. The rest of the time I just said "Kai" and "Hokkaido Inu, from the Hokkaido area of Japan"... since the Ken part just creates more problems than answers lol. @Kaja Shinkookoo LOL first time I've heard that one. @Dragonfly business cards... that's genius! Katsu gets the usual fox, wolf, coyote, akita, shiba inu, weasel face comments. Quite a few people think he's a basenji too--must be the curly tail. Most people also respond with "shikoko" so I often also say Japanese wolf dog or Japanese hunting dog. There are a handful of Japanese people we've met that get really surprised when they hear he's a Shikoku haha. They usually think a little, ask again, then have a shocked look. Yeah! My friend's mom is Japanese and was really surprised when she found out I had a shikoku. Like. REALLY surprised. Though she said something about fighting dogs, so I don't know if she was expecting a shikoku ken or a tosa... since they are also from the Shikoku area. A little boy learning to ride his bike on my street always greets Yuki with "Hi Wolf!" @Kaja, you're right in the sense that if you were to say Shikoku-ken or "Kochi" ken, some Japanese people would think of the Tosa. I've had it happen to me before when I'ved talked to some Japanese people. Shikoku (and the other region-specific dogs) are just that unknown/rare. My Shikoku was a Shih Tzu for a while according to his license in Providence, RI. I said "Shikoku" and that's what they wrote. I was recently walking downtown and after I told some young men that Meitou wasn't friendly for petting they decided his name was Killer and he was training to get into the military. Everyone who has seen Akira has thought he was beautiful, and a girl :), but none of them had ever heard of a Kai Ken before. I get "he's a husky/shepherd/wolf/cat/fox/akita" mostly. This guy across the street thought i was pronouncing 'Akita' wrong in saying Akira is a 'Kai Ken'. Went to a dog fair recently, and Kaja got a lot of attention. Some folks thought she was an akita puppy. Some figured she was a big shiba. Most comments were like, "she looks like a fox!" or "like a coyote crossed to a shiba". Ive had a lot of 'aww what a cute little wolf' and 'is he a fox?' Over the past week. I've had him out lots around other people over the past few days. There have been a few to whip out their phones, take a picture of him and write down the spelling of 'shikoku'. He gets lots of attention. @TheYeti That too! Spelling out the shikoku part for people on their phones, I mean. These anecdotes are great. It's interesting to read about how Nihon Ken are perceived in America (and I presume other localities). I don't have these kind of stories to share. But most of the few other dogs around here are either Western breed hounds, toy-type "yappy" dogs (sorry for the prejudice), or the occasional Shiba-Inu. So when there is any conversation about my girl Rika (Kai Ken) it's either "Otonashii" （meek, quiet, reserved）or "kakko ii" (Cool! )。(All of the above, in my humble opinion). There was an interesting thing when we went last year to register at the local municipal centre. Kai Ken are so rare, even in Japan, that when the City clerk first saw her he asked if she was a Shiba. I told him she was in fact a Kai. He actually had to Google the breed to get the proper kanji to write in for her registration papers. So yes. Your stories (I loved reading the posts). Things like that can happen even in Japan. As a Husky cross it would seem...Akita Inu and Shiba owner here. Oddly, at the new vet clinic we are the first shibas, but the vet was familiar with kai ken. Apparently one of his college friends had two ten year old kai! But yes we get the same fox, coyote, baby wolf comments plus mini husky, mini akita, and basenji and corgi guesses too. At least the first three seem to be popular guesses for nk. But my favorite all time reaction was the little kid who told his mom to look at the baby deer (in response to my daintily built shiba girl who looks like a shiba with a sighthound build). Strangely we hear the deer/fawn comparisons in response to her on a semi-regular basis. I also like that the new google photos app categorizes them as both dogs and cats. @violet_in_seville corgi?!?! I wonder why hahaha. Deer is even odder to me! @emi802 - you would laugh even harder if you had ever met my girl. You know how adolescent nk sometimes hit that gangly stage where they've gotten tall and leggy but haven't filled out yet? My girl is permanently physically stuck at that stage. She's got a deep, narrow chest, long legs, and a teeny tiny waist. We jokingly call her the supermodel, and our breeder has referred to her as the little giraffe. We figured she would fill out in adulthood but she never did (and she's six years old now). I think corgis are super cute, but they have short stumpy little legs and that barrel body which is pretty much the polar opposite of our girl. The fawn/deer thing I think is because she's got those long legs. The second best comparison I've heard was from my partner who got to play with some adolescent cheetahs during a business trip to South Africa. I believe the cheetahs had been found essentially abandoned as babies on the reserve due to the death of the mom (by poacher unfortunately) so they were raised by the staff. They were quite people friendly so you could pet them and interact with them. When my partner returned he was showing me photos from the trip and mentioned that the cheetahs really reminded him of our girl dog in terms of mannerisms and behaviors, and even play patterns. I was surprised and said, "really?" and looked over at her and she was literally in the exact same pose as the adolescent cheetah in the photo he was paused on at the moment. The worst thing I've heard in response was after I explained to some woman that they are a native japanese breed, she said "oh yes, she looks japanese. After all she's got those slanted eyes." My partner thought that the woman's stupidity eclipsed the offensiveness, but to be honest I've never quite been able to let that one go. On the big cats and mannerisms -- yes! We were watching a documentary on lions and we couldn't help but notice similarities to the way our girl behaves. Also with our Akita Inu I've already had a lot of comments asking if she's a Husky and someone insisted that she isn't a pure Akita. I don't argue, I just go right along with it, of course they know best! Yesterday I overheard someone say this about Meitou: "You could mistake him for a wolf!" Okays I've now heard 2 people say, 'is that a cat she's got on a lead' about my Akita pup. I seriously think people need to invest in glasses around here lol. People either gush over my akita girl or they cross the street when they see us coming. A lot of people ask if she's a chow mix. Or assume that she's a malamute. That doesn't bother me. What bothers me is all the people with leash reactive dogs who shoot me dirty looks and mumble about aggressive dogs when their dogs start going bonkers. Guy: "I thought huskies were supposed to be friendly?" Me: "I'm sure they are, but these aren't huskes! They're Japanese Hunting Dogs!" We get "OH! HUSKIES ARE MY FAVORITE DOG! :D" every once in a while. And in my head, I go "well, it's great you can identify your favorite dog." and in reality I go "oh, well that's cool." Oh @Crispy I feel your pain. This happens most often when I go in to pet stores, I've noticed... even if I mention she is a shikoku, people will say things like: "Oh my friend has three of these! One even looks and acts exactly like yours does!" And I think to myself -- really? Your friend has three of these? Shikoku? I don't have the nerve to ask them if it's a shikoku for reals or if it's a shiba or something. Sometimes I'll mention how there aren't very many in North America and then they give me a look like I'm absolutely nuts. Like their eyes are saying... yes there are, my friend has three. I presume people are mistaken when they say that sort of thing... more often than not I just assume they are thinking of a shiba or a husky variant. But I do wonder, sometimes! Number one thing i hear people call katsu... Hmmm i think the biggest annoyance to me is when i say shikoku slowly, they say Shicoco? We actually had a battle with our veterinary secretary over what breed Rollo was. She made up an ID card that said Rollo was a Shiba inu. We had to convince her that a Shikoku is a real breed, and the veterinarian straightened her out haha. The card is now corrected! I have only had ONE person confirm that they were talking about a Shikoku (the lady like, whipped into a Dunkin Donuts parking lot to talk to me and TK when she saw me walking him and asked me "OH MY GOD WHERE DID YOU GET HIM???" Auugggh, painful. I actually have been giving my vets my Kishu Ken cards. For TK, I write his breed and give the North American Shikoku Club website. someone once told Peggy they had been doing their research for a very long time now and knew ALL about Shicka-coos. @TheYeti That happened to us too! The vet secretary ignored what we told her and put shiba inu. Then, the vet said "This is a pretty large shiba, especially for his age... and he's the calmest shiba I've ever met!" Then we had to explain he's not a shiba :( At least he fixed it afterwards. When we first got our two shibas years ago no one knew about shibas so we got husky, fox, wolf, etc. Now a days shibas are super popular so we no longer have that issue. Well now we have our Kai Ken baby and not even the vet knew what he was, they had to look it up, they assumed he was a mixed breed shiba and on his records it says "mixed" under breed because the vet office only has a limited list of breeds to choose from and Kai isn't one of them..According to them they cant manually input a new breed. I said boo to that lol! Strangers have asked if he is a chow, shiba, German Shepard... once I tell them he's a Kai Ken they say oh wow that's cool and some ask more in-depth questions and others say oh ok yeah he's cute and walk away. It is what it is. Doesn't bother me much, its kinda neat to be able to educate people on the breeds especially to the ones that show a genuine interest. No one has come up to me knowing she's a shikoku, but I did have someone (with a shiba) ask recently if she was a kishu! I was really surprised by that. Was the most decent guess I'd heard. I really am considering making cards, it seems like such a good idea. lol, @Kaja! I wonder if it's because there are more sesame Kishu in the USA/North America, now. When I first started sharing Nami, people would guess or ask if she was a Shikoku Ken (online, where people generally have more access to random breeds), but now no one questions her breed - and most people get that she's a Kishu right away. Tho come to think of it, someone has asked if TK was a Kishu... I don't remember where or when... but it was right after I got Nami. @Crispy ... really! I wouldn't have guessed that. I wonder what circumstances made the kishu a more known breed. ~65% of the time people correctly ask, "is that a shiba?" or "is that a shiba inu?" - "Is that a shibu?" - "I've never seen a mini husky before!" - "Is that an akita puppy?" - "I thought she was a pomeranian with a haircut." - "That looks like a husky / pomeranian." Actually today, some guy ooh'd at Pylea as we were crossing an intersection downtown and asked if he could pet her (in the middle of the crosswalk!) and I said no, and he muttered something about me being Asian as I walked away. I wish I had heard what he said, lol. The neighbors father thought the Kai were wolves. Didn't help that Taka killed their 2 chickens. And of course I can't keep a collar on Taka because she chews hem off. That freaked out the neighbors wife so she texted me freaking because they were going to bite her kids. Meanwhile Jim ( the neighbor) at work in another part of the state is receiving phone calls and texts from his wife and dad in between trying to get a hold of me to let me know one of my dogs is out. Taka of course has no idea she did anything wrong... Lol. in fact she was quite plesed with herself... Oh Taka please stopping digging out!! I have since found her a training collar with pink material threaded through it... There chew that... Hate leaving collars on especially chain ones but I dont want anyone to shoot her thinking she is a wolf. One conversation went like this. Stranger : what kind of dog is that? Me: are you familar with the Akita from Japan ? Me: the Shiba Inu ? Me: Nooo Kai Ken.. K-a-i K-e-n .. Kai and Ken like the name. Ken means dog. Him: Oh I heard of those... My uncle had one..
Oh great so you know they are a meduim size Japanese hunting dog.!! Awesome !! At that point what else can you say! I once had a neighbour who insisted Tojo (shiba inu) was an "Ainu Spitz." Which is kind of weird, because Ainu is another name given to Hokkaido Ken. You'd think someone who knew about Ainu would know about shiba inu. But it was really weird, because I'd say, "He's a shiba inu", and she'd respond, "Yeah, an Ainu Spitz." So, I'd repeat, "No, shiba inu", and she'd reply, "Ainu Spitz, that's right." Stranger: What kind of dog is that? Me: A Japanese hunting dog. Stranger: Japanese? Oh, she must be really smart! Sorry to bring up an ancient thread but even here (in Kanagawa, Japan) most people go "Shiba?" at first when they see Sky, and then "wow, Shikoku?!" when I correct them. I've only had one person correctly ID him so far, and that was a woman with four(!) Samoyeds. If only they were more well-known here, too! even in Japan my Kai gets mistaken for other types of dogs too! I've had him called a shiba especially when he was a puppy, some people were convinced he wasn't a Japanese dog, others have confused him for different nihonken breeds, but it's really heartening when he does get recognized correctly, especially when people are excited to see a kai or just meet one for the first time. It's a bit like he's a breed ambassador. One time a couple of little girls kept telling their mom that he was a wolf! Stranger: Is that a patterdale? I used to own those. Me: no, she’s a Japanese Breed. Stranger: yeah, a Japanese dog crossed with a patterdale! I had one of those too.